Employees need to connect to the company LAN from outside or home? Remote Access VPN realizes virtual network cable from a Client PC to the LAN from anywhere and anytime. The ad-hoc network allows communications only for just VPN-established member PCs. However if your company has a lot of computers on the corporate network, it is not practical to install VPN Clients on all PCs on your company. This is the reason why Remote Access VPN is necessary for middle and large-scale corporate network. 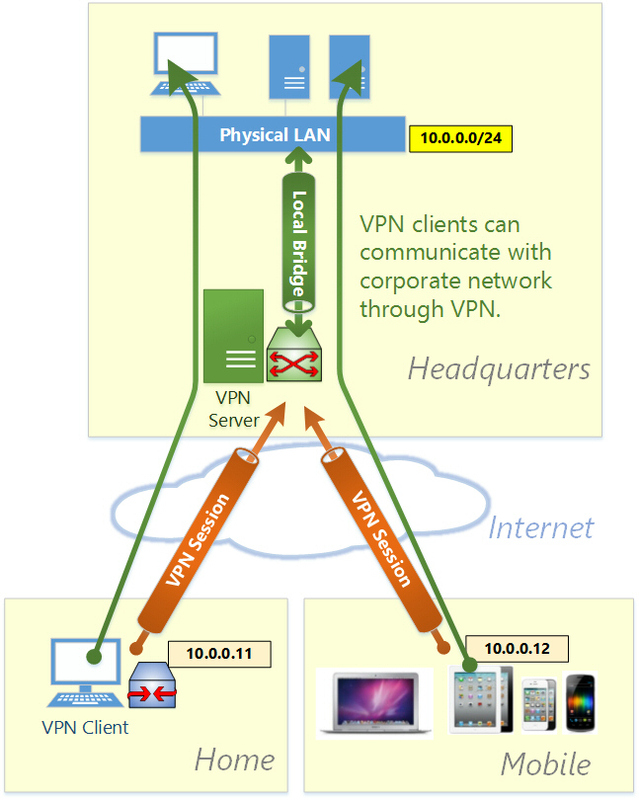 Remote Access VPN is an extended topology of the ad-hoc network. The difference between ad-hoc VPN and remote-access VPN is similar to Wi-Fi Ad-hoc mode and Wi-Fi Infrastructure mode. With Wi-Fi Ad-hoc mode, every computers must connected to the single Wi-Fi segment. Unlike this, Wi-Fi Infrastructure mode allows communicating computers on both Wi-Fi segment and Physical Ethernet segment. In order to build-up a Remote Access VPN you can use Local Bridge function in order to connect between Virtual Private Network segment and physical Ethernet network segment. After that, any remote computers which are connected to the Virtual Hub via VPN will be treated as a part of the existing physical Ethernet segment. 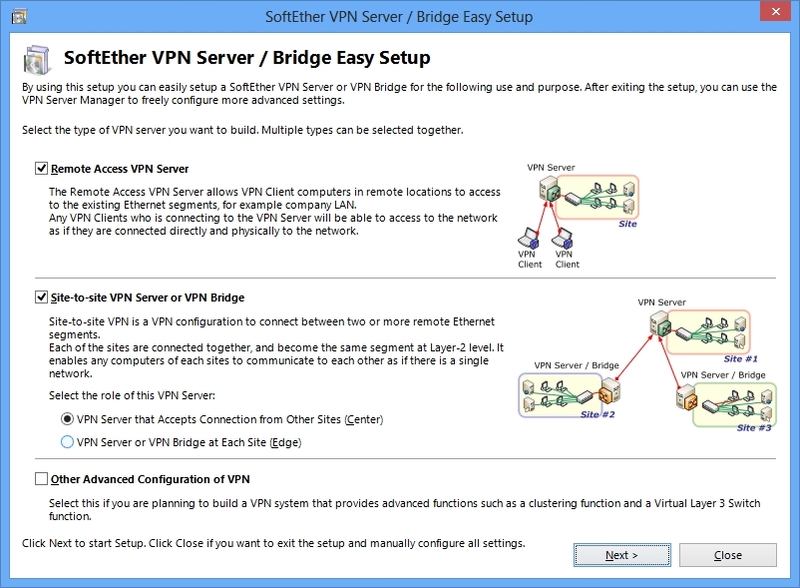 You can set up SoftEther VPN Server on a computer in your corporate network. 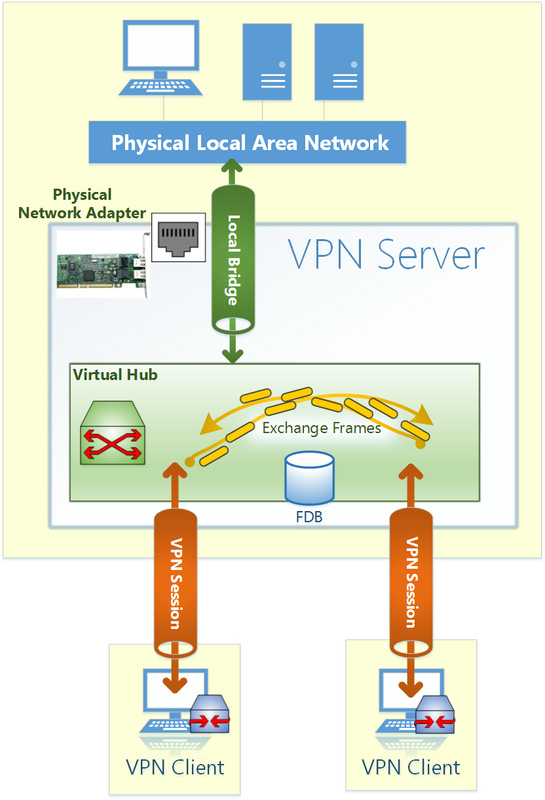 It is recommended to set up VPN Server on a computer which has two network adapters where one is connected to the corporate network and another is connected to global Internet segment. However if you cannot prepare such an ideal server, you can try SoftEther VPN Server on a PC which has only one network adapter to the private network. Because SoftEther VPN Server has Dynamic DNS and NAT-Traversal function, you can reach to such a private PC from the Internet. Installation is very easy by using Installer and Initial Setup Wizard based GUI. In order to allow remote accesses from client PCs to the corporate network, you must define a local bridge between the Virtual Hub and the physical network adapter on the corporate network. 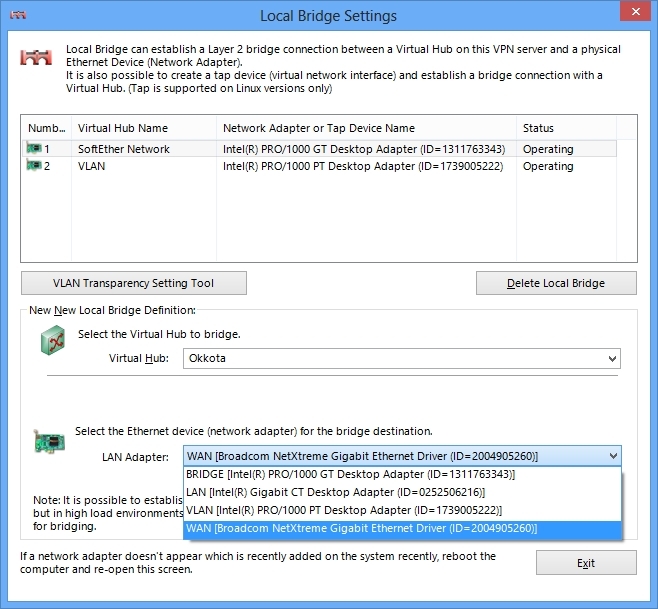 Making a local bridge is done easily by Initial Configuration Wizard or you can add it manually after the initial setup. On the VPN Server you can add several user objects on the Virtual Hub. Each user object has a password. 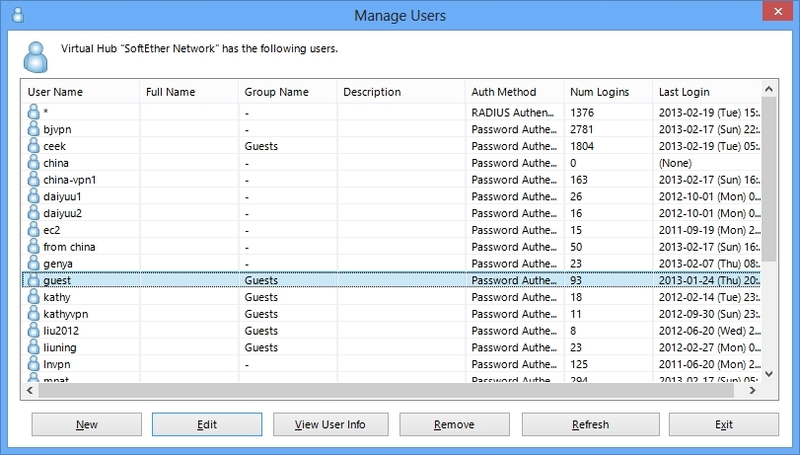 After that, distribute pairs of username and password to each member of the VPN. 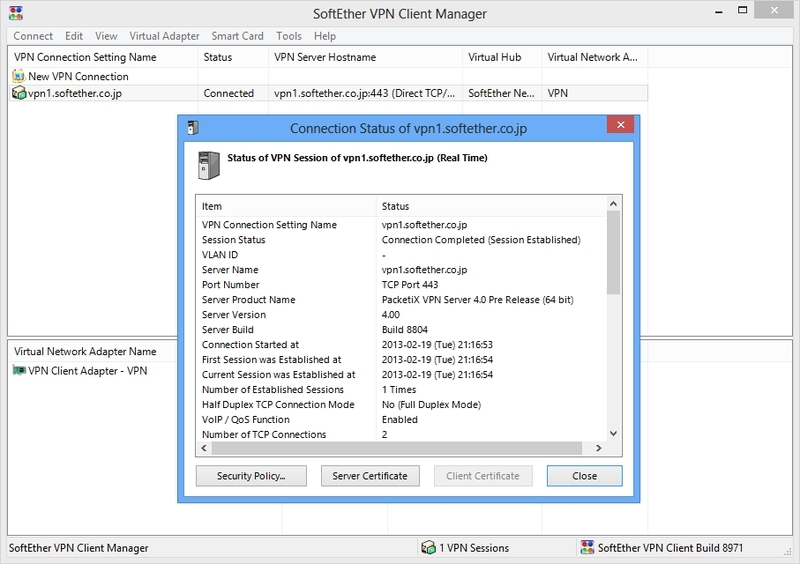 On each member's PC install SoftEther VPN Client. Enter the server address, username and password for each PC. If a member of the VPN is Mac OS X, iPhone or Android, set up L2TP/IPsec VPN client on each PC instead of SoftEther VPN. Another solution is to use OpenVPN Client on Mac OS X, iPhone or Android to connect to SoftEther VPN Server. Now each member PC can connect a VPN to the corporate network. After a VPN connection is established the client PC is regarded as a part of the destination network. Then a PC can use remotely any applications for LAN-oriented, for example groupware, SAP, SQL client and enterprise systems.